Dean Feinstein hosts meet and greet for international affairs alumni in D.C.
SGIS Dean Lee Feinstein and the Indiana University Alumni in International Affairs hosted a happy hour event at the new IU Washington, D.C. office Thursday June 15, an alumni networking event for School of Global and International Studies. The event attracted many professionals with IU connections in the nation’s capital as well as IU alumni leadership. The networking event participants ranged from new graduates to more established graduates. 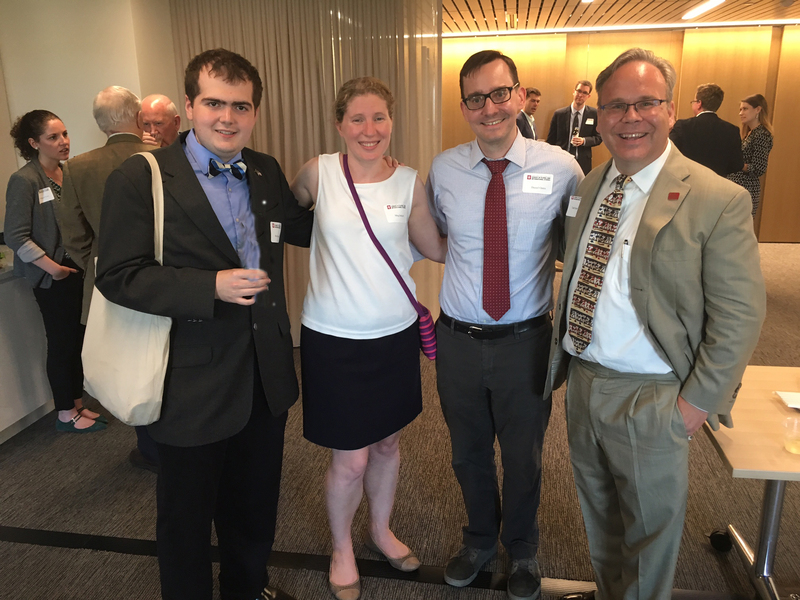 Vice Chairman of the IU Alumni Association Robert Johnson, associate general counsel at the Office of the U.S. Trade Representative in Washington and IU alumnus Kathleen Claussen (who is featured on the new SGIS career services page) introduced the dean to 50 alumni and friends. Other attendees included former senator now SGIS Distinguished Scholar Richard Lugar, IU alum and strategic communication and financial services policy expert Todd Harper, and retired Air Force Brig. Gen. Carl Reddel, the executive director of the Eisenhower Memorial Commission who holds a PhD in history from IU and a certificate from the Russian and East European Institute, which is now part of SGIS. “D.C. is a hub for SGIS students so it was a good engagement event because you have a lot of alumni in a small area” said SGIS Associate Director of Development Callum Stewart. He added that there is a strong presence of Indiana University alumni in the Washington, D.C. area. Stewart said the new office allows for a stronger connection between alumni and more opportunities for networking events. The new Indiana University Washington, D.C. office is located in the Willard Building at 1455 Pennsylvania Avenue NW, Suite 1125. This event not only promoted networking within the IU alumni in the international affairs community, but also awareness for what is currently happening in SGIS. There will be a follow up engagement event in D.C. in the forthcoming academic year.